a septage treatment plant-STP of 11 000 m³/year. The WTP discharges into the river a water quality similar to that released by the usual intensive treatment processes, with operating costs twice as low, a markedly lower carbon impact and a greater reliability. Integration of the initial ponds into the treatment process improves nitrogen and phosphorus removal in the summer – the most sensitive period for the receiving streams. The septage plant discharges very little water (less than 5000 m³/year at nominal load) of good quality into the river (BOD5 < 25 mg/l; COD < 125 mg/l; SS < 150 mg/l). The filtrate is treated in existing ponds during the winter and spread in the summer on a tree plantation operated as Short Rotation Coppice-SRC whose wood production feeds a communal heating system. Both operations complement each other and follow a pattern of heritage and landscape preservation, sustainable development, mitigation of global warming (by reducing non renewable energy consumption and greenhouse gases-GHG), of technical progress, and transfer of knowledge especially to poor countries. The system is simple, natural, reliable, sustainable, and economic. It addresses the problems of wastewater (up to 10 000 PE) and septage treatment (up to 20 000 m³/year and more) in France and throughout the world. CCTVA supports, in connection with the Adour-Garonne Water Agency, the creation of a system for the collection and treatment of latrine septage in Toamasina, Madagascar in an aim of humanitarian assistance and technological transfer. On the 29th and 30th of april 2015 took place the first meeting around the european project Alera destinated to highlight, via a dedicated web site, the reuse actions of the treated waste waters throughout the Pyrenees-Mediterranean euro region. The Granollers district (Spain), who brings the project, organised these two days of exchanges between the members of a work group composed of representatives of the Polytechnic University of Catalonia, the Migjorn Gran (Spain) town council, the consulting firm Ecofilae (France), and the CCTVA. Technical and economic performance of the wastewater and septage treatment plants depends on the behaviour of the users i.e. 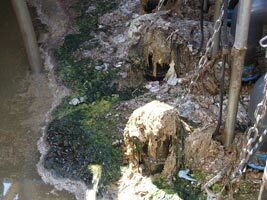 the customers of the sewered sanitation and owners of on-site systems. Nègrepelisse's WTP simplifies the life of technicians and of the elected representatives, improves the water quality of natural rivers and restocks the fish in the Courounets river for at least three to four or even ten generations of Nègrepelisse citizens. However, it imposes some rules of good conduct on the users. The old concept of "all-uses sewer system" must be forgotten and replaced by a general consciousness that everything thrown into a toilet will eventually end up in the treatment plant. The October 2010 issue of the Adour-Garonne Water Agency magazine introduced the WTP of Nègrepelisse, highlighting the innovative character of its design and the integration of the existing ponds into the treatment process. The plant’s functioning principle according to the season.